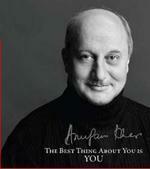 Gopal's Bookshelf: The Best Thing About You Is You! Quotable Quotes: "Bheega Hua Aadmi Baarish Se Nahin Darta"
"It is not enough to succeed; others must fail"
"Most of us are driven by sadistic instincts"
Anupam Kher's new book teaches valuable life lessons. It tells nothing new than the things that we already know but are not ready to either understand or acknowledge. The books is divided into multiple chapters; each dealing with a small facet of life. Kher does not try to be preachy but he rather breaks down the more important things in life to small easy to understand pieces. The book is more about you discovering yourself and finding things about yourself that make you tick, makes your life worth living. In this book Anupam Kher has distilled years of wisdom handed down from generation to generation in a format easy to read and understand by today’s generation. He has cut across the meaningless platitudes and gotten straight to the point. It’s a coffee table book for people who want refresher course to life lessons. This book is a must read for folks who are confused and want solution to life’s problem fast.